A group of Seattle school librarians documented the gaps in books and other materials between school libraries in rich and poor neighborhoods. Now it is lobbying the district to fund all libraries better — and equally. When Pat Bliquez interviewed for the librarian job at McDonald International Elementary in Seattle’s North End a few years ago, she asked what her library budget would be. For more than two decades, she had dealt with a shrinking library budget at another school in a poorer neighborhood. She scrambled to get books wherever she could, sometimes using her own money at used-book sales. “I found out if I wanted any money, it was all going to come from the PTA,” she said. Parents at her old school — Roxhill Elementary in Southwest Seattle — were supportive of the library, too. They just didn’t have the means to raise anywhere near the thousands that McDonald does each year. The libraries at the two schools do have one thing in common: Neither one is guaranteed any money for books or materials. While Seattle Public Schools provides money to each school that could be used for libraries, the principal and other school leaders decide whether to spend it that way. In 38 percent of Seattle schools this year, the leaders didn’t choose to use that money in their libraries. 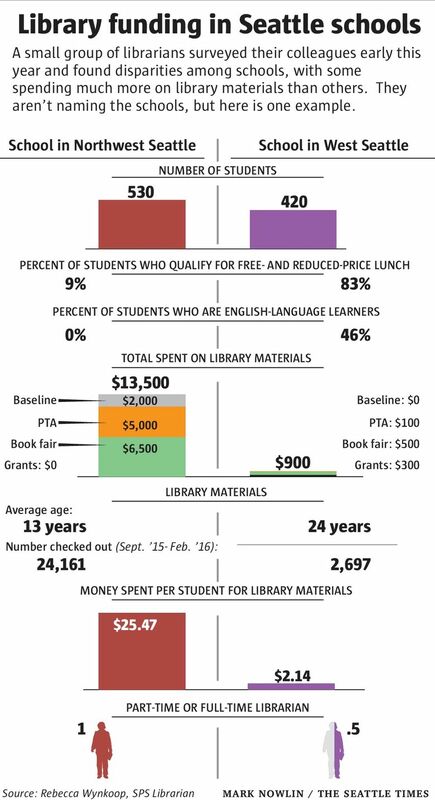 Overall, Seattle’s district office provides only about a quarter of the $535,096 that schools spent on library materials this year — the rest came from PTAs, book fairs and grants. On average, that means the district’s contribution is only about $2.55 per student, barely enough to cover the cost of one magazine. Seattle isn’t alone. In a survey done by the Washington Library Media Association last year, more than half the 1,437 schools reported their districts spent $1-$10 per student. The national average, according to a survey by School Library Journal, is $10. In some Seattle schools, parents provide a lot of extra help, but that’s created a disparity among schools in the number and condition of books — and the number of hours each school library stays open. Yet a similarly sized elementary in West Seattle, where 83 percent of the students qualify for federal free- or reduced-price lunches, only $2.14 is spent per student for books and other items. An average book in that school’s library is 24 years old, compared with 13 in the Northwest Seattle school. Overall, Seattle school libraries are out of date and underfunded, the librarians say. About half spend less than $10 per student for library materials each year, which includes books and, increasingly, e-books and other electronic materials. But librarians still rely a lot on hard-copy books, in part because many students don’t have devices to read digital versions at home. Earlier this year, a small group of librarians decided there needed to be some sort of study when the members realized that none of them could remember when schools had all received an equal amount of money for library materials and staff. That was in sharp contrast to her time as a teacher at South Shore PK-8, at South Henderson Street near Rainier Avenue South, where she said the library’s materials budget was less than $1,000. The group asked its colleagues to report how much each library gets from the district, from grants and from parents. It also asked for the number of books in each library, the books’ condition and how often they are checked out. Finally, the group wanted to know how many librarians work in each school. The data collected didn’t come as much of a shock. 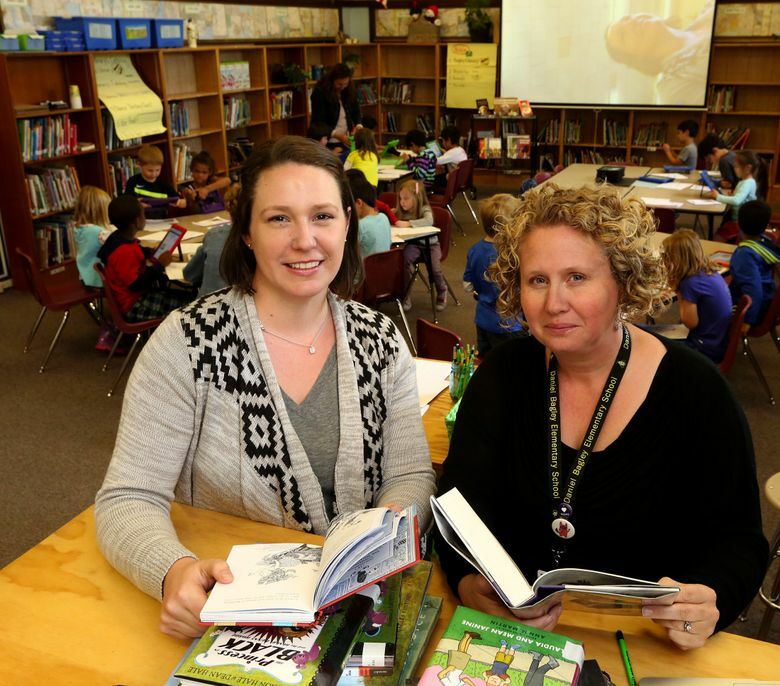 “It was confirmation of a problem that we knew existed, but that had never been brought to light,” said Rebecca Wynkoop, the librarian at Daniel Bagley Elementary, north of Green Lake. Wynkoop said the district hasn’t had dedicated funding for library materials in three or four decades. And the district pays for only a part-time librarian at each elementary school, although some schools raise money from parents or other sources to keep libraries open longer. The Washington Library Media Association says most districts, like Seattle, let schools decide whether money will go toward libraries. But some provide money specifically for library materials. Tacoma is one example, where officials gave $750,000 — roughly $26 per student — to update school-library collections this year. The association’s study and other research show a connection between good libraries and academic growth. Students who attend schools with certified teacher-librarians and high-quality facilities performed better and were more likely to graduate, regardless of school size and student income level, it said. “The very students that most clearly benefit from a quality library are also the least likely to have access to one,” the researchers wrote. In Seattle, the differences in libraries between have- and have-not schools are most extreme at the elementary level, with $28 per student separating the lowest- and highest-funded schools, according to the librarians’ survey. The members of that group won’t say which schools are at the top and bottom because they agreed, as they collected information, not to reveal the schools’ names. They worried that identifying them might make it seem like they were blaming the librarians, principals or school PTAs. But they are releasing data about the difference in spending among schools — which ranges from $1.69 per student to $29.88. “The district needs to realize there are some schools without PTAs, and it’s just not fair,” Eads said. “I loved my students at South Shore, and I felt regret that they didn’t get the same things that my lovely and adorable Green Lake students received,” she said. And there is a usage gap, too, because some libraries have more staff — often funded by parents. In the case of the Northwest Seattle and West Seattle elementary schools, for example, the Northwest school has a full-time librarian and the West Seattle school just a half-time one. And between this past September through February, the Northwest school’s students checked out 21,000 more books and other materials than their West Seattle counterparts. Even if libraries appear to be the same size, a close look at the books on the shelves would show that higher-income schools have better, newer collections, said Craig Seasholes, the state library association’s president and the librarian at Seattle’s Sanislo Elementary, in the Delridge neighborhood. Keeping the collection updated is especially important with nonfiction books. “Book reports on Pluto being a planet don’t happen in well-funded schools,” he said. The concerned group of librarians want three things: equitable funding for all Seattle schools, full-time librarians in every school and a new district library-services manager. The district has a manager for library services and instructional technology, but the librarian group would like to see a manager whose job is dedicated solely to advocating for libraries. It presented its concerns and recommendations to district officials last week. It suggested the district could require a certain amount of funding be spent on library programs and items. The group also wants staffing to be consistent, based on the number of students in each school. And it asked the district to allocate $10 per student for library materials each year. The library group knows change won’t happen overnight. But district officials are listening, and the librarians are confident the inequities will be addressed.